Julietta Parra Ducote is a native of Bogotá, Colombia and currently lives in Houston, Texas. Julietta has been involved for many years in the art of poetry. She is a published poet and her work has appeared in Illuminations, and ArtLies Journal. 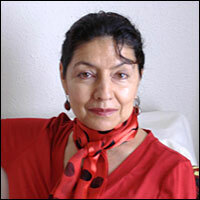 She also contributes to articles pertaining to art reviews and flamenco dance programs. Julietta’s major subjects of interest are the poetry and literature of Latin America, Spain, as well as the dance, music and history of flamenco. Ms. Ducote has produced poetry readings and flamenco programs for the Society of Flamenco Arts and other nonprofit and cultural organizations. She is currently working on her book of poems. Hundreds of yarns producing silk for the pleasure of others..